Finding low carb breakfast options can be a challenge. This is a favorite breakfast recipe of mine when I’m in the mood for something other than eggs. 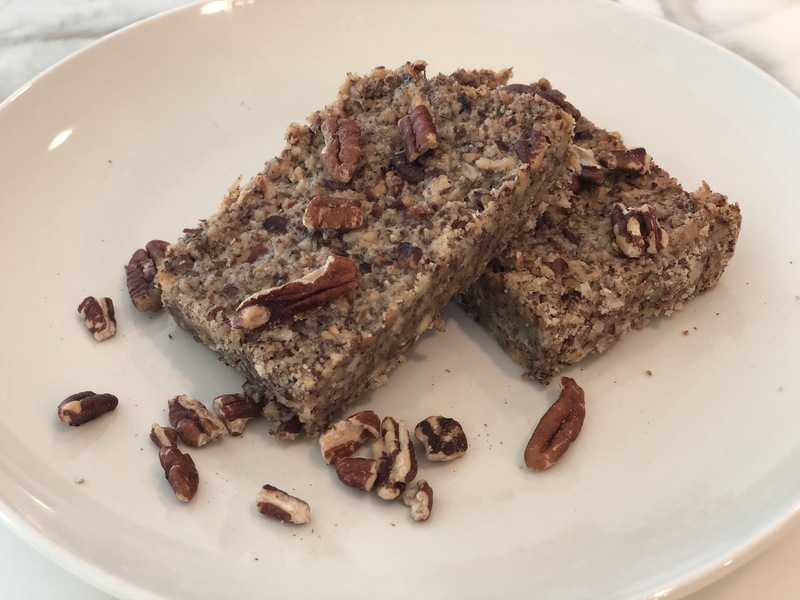 This KETO recipe is delicious, quick and easy to make, it comes from the ruled.me cookbook. These are the ingredients you will need to make 4 breakfast bars. Toast pecans in the oven for 6-8 minutes at 350F, remove from the oven and let cool. Place the pecans in a plastic bag, and crush them using a rolling pin. Add all dry ingredients to a bowl, including pecans, and mix together. Add wet ingredients and mix into a crumbly dough. I didn’t have sugar free maple syrup on hand so I used regular. Press into a small baking dish. Bake for 20- 25 minutes at 350F. Remove and cool completely, then refrigerate for at least 1 hour. 453.9 Calories, 45.7g Fats, 3.0g Net Carbs, 7.4g Protein. For more delicious KETO meals, check out posts HERE, HERE and HERE. Subscribe to Happy Haute Home to receive low carb recipes right to your inbox, and follow along on Pintrest HERE, and Twitter HERE and feel free to pin and tweet your favorite pics from Happy Haute Home. Oh no Lynn! That stinks! Are you allergic to all nuts? I love nuts, that would be so hard for me. Sorry! Oh wow! That’s a super fun recipe! It makes me think of magic cookie bars but low carb. Good recipe!!! Thanks! They are really tasty too! My husband read the blog post, came home and asked for them…but they were all gone..eeks! Oh no! Did you make him some more? My husband works from home so he is always my resident guinea pig. He has to try all of my recipes for the blog. I think he loves it. Not yet..but I will! I need a guinea pig too! !